Welcome to The Ordinary’s sick day ramble! I’m feeling poorly. Aches and pains and ague and fog and general sluggishness and stupidity. I’m sure I have a lot to do, but I’m equally sure that none of it is at all important and most of it will be undone later in the day anyway. I’m having a hard time persuading myself to do anything but sit next to Clio sharing a blanket, with my cold hands under her warm soft paws. She keeps looking up at me like I’m crazy, she keeps singing nervous yawns, because she thinks we have a lot to do, too, but she can’t remember what it is. But all dogs are narcoleptic, so she’ll fall asleep in a minute, and then I really won’t be able to move my hands. Outside the world is snowy and bright and melting, and people going by seem happy, but to me the snow doesn’t look like something fun to be out in, it looks like something good to be in from. I was thinking that I’d like to be Clio–not just warm and pretty and curled on the couch–but happy and cheerful and loving all of the time. But then I was thinking she probably has worries that feel as big to her as my idiotic worries feel to me. She might miss her brothers and sisters. She doesn’t know why we have to leave her alone for hours at a time, which might feel like days and days to her. She doesn’t know where we go, but she thinks it might be because she’s done something bad. She’ll probably never catch a squirrel, no matter how often she tries, and how fast she runs after them in her dreams. (“That sweet squirrel, you ain’t ever gonna catch it, never ever gonna catch it,” doubtless playing on repeat in her head.) One of Isaac’s favorite stories is of the time that Steenbeck the dog actually did catch a squirrel. She was so suprised that she dropped it. It’s a legendary tale in my family. My friend, who also has a squirrel-chasing dog, said he’d start using the phrase “dropping the squirrel,” in her honor. And to suit the bittersweet ambiguous quality of the emotion, he translated it into German, “das Eichhörnchen fallen lassen.” It happens so often in life! All that you ever wanted and more than you bargained for! You whine because nobody throws you the ball, and then when they do, you freeze! Well, I’ve been thinking about this idea in relation to all of the things I’m applying for lately, and all of the silence, terse rejection and discouragement. I’ve been thinking that I don’t really expect any other response, but it doesn’t keep me from trying. I’m still chasing that squirrel even though it runs up the tree. I don’t think there’s a chance of dropping it because I’ll never catch it, but you never know, maybe I should be ready. Or maybe I should just think, like Clio seems to do, that running after the squirrel is enough. The trembling excitement, the palpable adrenaline, the mad rush. And again, and again! I doubt she’d want to actually catch a squirrel anyway, it would probably scratch her eyes out. Or maybe she’d just be friends with it and they’d play tag, as Isaac has suggested. Either way, friends, be careful what you wish for and happy when you get it. Enjoy the chase, and whatever you do, don’t drop the squirrel! The worst part of being sick is that I can’t taste or smell and my appetite is compromised. It makes me feel half-alive. And I only want soft and comforting things like mashed potatoes, or very strongly flavored things like ginger beer. These biscuits (in the American sense of the word) are soft, comforting, and strongly flavored. Crispy outside, tender inside, and very easy to make. They have smoked paprika, smoked gouda and black pepper, so they’re roasty toasty. Nice with soup or stew when you aren’t feeling well, or even if you are. Here’s Squirrel Nut Zippers with La Grippe. Doubly pertinent! Mix the flour, bp, bs, salt, paprika and pepper in a large bowl. Grate in the butter, and mix with a fork till it resembles crumbs.Don’t be afraid to use your hands!! Grate in the cheese. Stir in the buttermilk. Mix well. It should be quite thick, but thin enough that you can dollop it, if you know what I mean. You want it to be dollopable. Drop little mounds of batter on the baking sheet. I use a Tablespoon, and probably do two or three heaping spoonfuls for each one. You can make them as large or small as you like, though. Just watch the baking time! Cook in a preheated 425 degree oven for about 15 minutes (less if they’re smaller). They should just start to brown on top when they’re ready to be eaten. 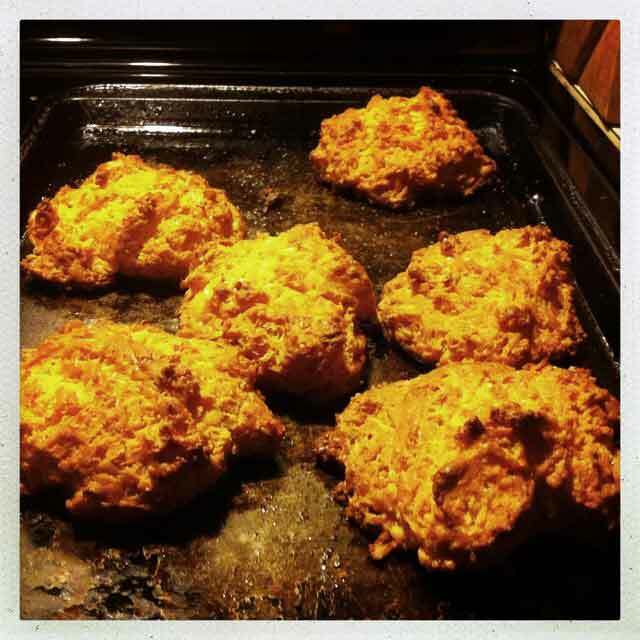 This entry was posted in bread, recipe, Uncategorized and tagged buttermilk biscuits, cheese biscuits, smoky biscuits by Claire. Bookmark the permalink. Oh, poor you, steenbeck – I hope you feel better soon! Have the school holidays started? (I’m guessing not yet.) On Monday Ellis came round after school and we made one of your pies. Well, it was sort of one of yours, and sort of one of ours. That boy is a whizz at rolling out pastry! He will be 5 tomorrow and he’s having a Scooby Doo cake. They have all of next week off. They go back Jan. 2. How fun that you made pies with Ellis! And what could be better than a Scooby Doo cake? Thanks! I’m mostly fine, I’m sure, just a bad cold (as opposed to the good kind.) I just wanted an excuse to sit on the couch with Clio and stare into space.